True to the promises I was given on the internet regarding Episode 11 of Ressha Sentai ToQger, we have had some new developments in the form of learning the identity of and meeting the Emperor of Darkness, Zett. Zett is by far the weirdest villain I have encountered…well, ever. We meet Emperor Zett in Episode 11 during yet another pit stop by the ToQgers to check out an amusement park town. Things are pretty normal, until Right meets a stranger and befriends him. As fate would have it, this stranger is no other then Zett, the Emperor of Darkness! You can’t just meet a normal person to be friends with can ya, Right?? It turns out Baron Nero and the rest of the Shadow Line have been able to amass enough dark energy in the past few operations to form a line to bring the Emperor of Darkness to their base. However, Zett had plans of his own, as he stops at the amusement park to check it out, which sends Nero, Schwarz, and everyone else into a frenzy to find him and bring him back. 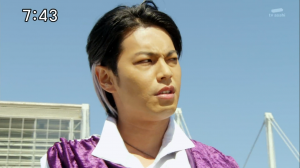 The Shadow Line arrives at the amusement park to find Zett palling around with Right and the rest of the ToQgers, and marveling at how they “sparkle” so much. The two sides break out into a fight, ending in Zett collapsing. Evidently, his body can not withstand much exposure to the light. The Shadow Line sweeps up Zett into a Shadow Train and flees the city, with the ToQgers in pursuit. The Shadow Line escapes, and Zett sends his guard Lamp Shadow to test the ToQgers ability to “sparkle” at the end of the episode. Lamp Shadow absorbs all imagination in the city, making it impossible for Tokatti, Mio, Hikari and Kagura from seeing their Resshas or believing in their being ToQgers. This leaves it all up to Right to save the day. While racking his mind for a way to restore his friends to normal, Right begins to remember memories of his childhood, about the five of them being linked by their Rainbow Passes, which would later turn into their ToQger passes (used to board their Resshas), along with the rules of their childhood club. Using this memory, Right is able to bring everyone back to normal and unlock Chou ToQ-Oh (mecha combination using every Ressha in their arsenal) to destroy Shadow Lamp! Episode 13 begins with another search for a Support Ressha to continue to make up for the great power drain of Chou ToQ-Oh; this time it is Fire Ressha. This episode brings us back to plot filler and character building between Right and Mio. Nothing very consequential occurs, aside from Mio understanding Right’s need for her to take leadership while he focuses on a task. I’m really hoping something happens soon to move the plot forward. For the most part we have only had filler and elements building up, but nothing big actually happens. It’s time for ToQger to leave the station!